beetroot poriyal recipe - poriyal is a preparation where the vegetables are sauted in spices and topped with grated coconut. in a pan heat 2 tablespoons coconut oil or gingelly oil (til ka tel or sesame oil made from raw sesame seeds). keep flame to a low and add 1 teaspoon mustard seeds. when the mustard seeds begin to crackle, add 1 teaspoon urad dal. stirring often fry the urad dal till they get golden and aromatic. then add 1 green chili (chopped), 10 to 12 curry leaves (broken or chopped) and 1 pinch asafoetida. mix well. then add 2 cups finely chopped beetroot or 2 medium to large beetroot or 250 grams beetroot (finely chopped). you can also add grated beetroot. add ⅓ cup water or add as required. cover the pan with a lid and let the beetroot cook on a low to medium-low flame. in between do check and stir. if the water dries up, then you can add some water and then continue to cover and cook. the beetroot should soften and get cooked completely. before proceeding to the next step ensure there is no water in the pan. if the beetroot pieces are cooked and there is some water, then cook without lid, so that all the water evaporates. lastly add 3 to 4 tablespoons grated fresh coconut. mix very well. switch off the flame and cover pan. 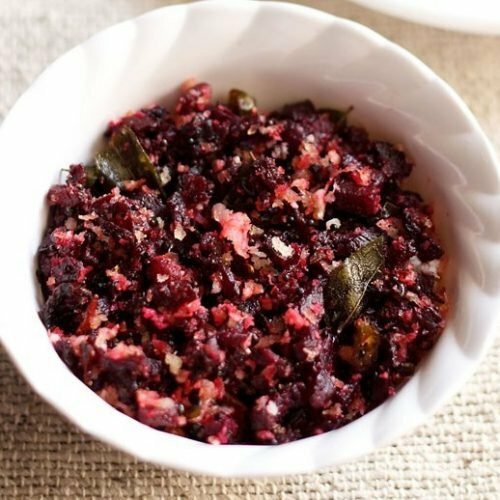 serve the beetroot poriyal hot or warm as a side dish with sambar-rice or rasam-rice or even dal-rice. can also be had with chapatis.